Altair Industries offers many different types of screwdriver systems, including manual to fully automatic screwdriving. Automated Screwdriving: We can supply multi spindle heads, autofeed screwdrivers with blow feed or screw presenting, and systems with part shuttles for quick load-unload of parts and assemblies. 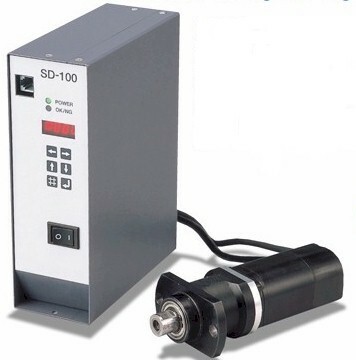 Electronically controlled autofeed screw drivers or manual systems can offer precise torque control and cross-thread prevention and feedback, and we offer systems with included vision inspection for improved quality control. Manual Screwdriving equipment and systems: We offer simple, effective, manual screwdriving stations, with or without vibratory bowl/blowfeeders or screw presenters. Our manual screwdriving stations include an X-Y "balanced" mount for the driver, that virtually eliminates cross threading due to improper driver angle. We offer both air powered and electrically powered screw drivers, depending on the application and precision of torque control needed. Precision part fixturing allows the operator easy access to the parts, but confines the product sufficiently to perform well in both manual or automated screw driving applications. Our precision KX-Series Servo controlled driver offers multi-mode operation and programmability for ultra-precise screw driving applications. We offer the Quicher line of screw presenters, suitable for many different types of screws. When Altair designs a screwdriving system or station, we strive not only to perform the operation at the required rate and torque, but to actually improve yield by eliminating cross-threading, verifying that the screw did not strip out, and even verifying physical screw presence in manual operations such as PC board applications that may have many screws of differing sizes. Automatic screwdriving systems can relieve bottlenecks on your production line and increase consistency and quality. Please contact our sales department for a quotation custom-taylored to your application. We will work with you to evaluate your requirements and provide a cost-effective solution that improves yield and quality.